Coming up we’ll hear a tremendous interview with none other than Jim Rickards, author of several bestselling books including Currency Wars and The Death of Money. Jim talks about how China may be on the verge of collapse and the likelihood of chaos that would ensue in the global financial markets that could be, similar but much worse to what happened back in August of 2015. Jim also breaks down several avenues that in his studied view all point to higher prices metals prices. 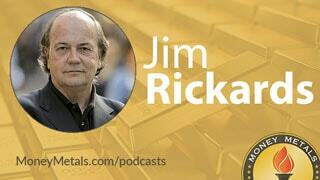 Don’t miss a must-hear conversation with Jim Rickards, coming up after this week’s market update. Another advance in gold and silver markets. Another record for the stock market. Another round of political drama in Washington. And another vow from the Federal Reserve to raise interest rates. Those are just some of the headlines being made this week. Janet Yellen: As I noted on previous occasions, waiting too long to remove accommodation would be unwise, potentially requiring the FOMC to eventually raise rates rapidly, which could risk disrupting financial markets and pushing the economy into recession. Incoming data suggests that labor market conditions continue to strengthen and inflation is moving up to 2% consistent with the committees' expectations. In spite of Yellen’s hawkish tone, she didn’t hit markets with much of anything new of substance on the policy front. Volatility remains fairly muted in equity and precious metals markets as they each make small advances. Gold prices are up 0.5% this week to trade at $1,240 an ounce as of this Friday morning recording. Silver, meanwhile, shows a 0.4% gain to bring spot prices to $18.09. Right now metals markets seem to be moving more on an inflation trade than a fear trade. Optimism for the economy and equity markets remains sky high, with investors hoping President Donald Trump will be able to push through a pro-growth tax reform package later this year. Higher rates of economic growth could leave the Fed behind the curve when it comes to rate hikes. That could create an inflation problem of the sort Janet Yellen alluded to in her comments. Yellen and company could clash with the Trump administration on monetary policy down the road. But for now, everything is coming up roses. Trump’s new Treasury Secretary is an ally of the Fed and the banking establishment. On Monday the United States Senate confirmed Goldman Sachs banker Steven Mnuchin to head up the Treasury Department. The vote was largely along party lines. Democrats objected to Mnuchin based his Wall Street ties and his role in promoting the types of financial instruments that fueled the subprime mortgage bubble. Democrats love to posture against Wall Street greed, but they rarely turn down Wall Street’s campaign contributions. In the last election, investment banks and hedge funds lent their financial support overwhelmingly to Hillary Clinton. They virtually shunned Donald Trump. And on monetary issues, Mnuchin seems more in line with Democrats than Republicans in Congress. Mnuchin says he supports a so-called “independent” Federal Reserve, which is the rationale Senate Democrats used to defeat the Audit the Fed bill last time around. A new audit the Fed bill is now pending in Congress. At some point President Trump will have to weigh in on it. But as long as the Fed remains accommodative and the stock market stays elevated, there may not be much political incentive for him to fight for greater transparency in monetary policy. Perhaps he will find motivation in Andrew Jackson. Trump hung a portrait of Andrew Jackson in the Oval Office shortly after moving in. He views the nation’s seventh president as one of his heroes. Trump’s inauguration speech was even called “Jacksonian” by many commentators for its populist and nationalist overtones. Among the many things President Jackson was known for was fighting against powerful banking interests and dismantling the then central bank of the United States. Jackson distrusted paper money and favored sound money backed by gold and silver. He was also a champion of fiscal responsibility. He left office in 1835 with the national debt completely paid down. Jackson was the last President ever to pass on a national debt of zero. There’s obviously no way that Donald Trump will be able to pay off the $20 trillion in national debt that he inherited from Barack Obama and predecessors. Not even Andrew Jackson himself could accomplish that feat. But a Jacksonian commitment by Trump to reforming the monetary system that made debt levels of $20 trillion possible could leave the country in a much better position when Trump leaves office than it is in today. In the meantime, investors shouldn’t count on political solutions to save them from the risks created by the monetary system. Investors ought to take their own steps to protect themselves from the threats of Fed-fueled asset bubbles bursting, rising interest rates, rising inflation, and possibly even a full blown currency crisis. Regardless of how high Washington raises the debt ceiling or how many dollars the Fed prints in the years ahead, physical precious metals will continue to represent a solid foundation of real value. Well now for more on monetary policy, the possibility of currency and trade wars developing between the U.S. and China and a top analyst’s outlook for gold, let’s get right to this week’s exclusive interview. Jim is a portfolio manager, lawyer, and renowned economist having been interviewed by CNBC, the BBC, Bloomberg, Fox News, and CNN, just to name a few. Jim, we really appreciate your time and welcome back. It's great to have you on again. Jim Rickards: Great to be with you. Mike Gleason: Well, first off, Jim, you just published an article at the Daily Reckoning regarding China that I want to have you comment on. Now, since the election of Donald Trump who is advocating for import taxes on goods from China and elsewhere, most of the focus has been on trade and China's efforts to devalue their currency. A trade dispute with China could certainly have significant repercussions in the U.S., but you raise a host of considerations beyond tariffs and currency markets. Talk for a minute about the internal politics of China, and then if you would, share some of the macroeconomic shifts you see developing between the U.S., China, and Russia, because things seem to be heating up here. Jim Rickards: Sure. The thesis on China is really independent of the election of Donald Trump and Trump's policy. Now, I think that's a big deal obviously. Trump has very firm views on China and he's got a staff of advisors who are going to pursue those, so I think there are a lot of very important things in play in the area of currency manipulation, tariffs, trade, subsidies to Chinese state owned enterprises, et cetera. We'll talk a little bit about that but there are bigger things going on in China that are true, regardless of Trump's policies, even regardless of his president. Just to cut to the chase, China is going broke and when you say that, people roll their eyes. They go, "What do you mean China's going broke? It's the second largest economy in the world and it's got the largest reserve position in the history of the world and it's got a big trade surplus. I mean, what are you talking about?" But if at the end of the day you have more hard currency coming in than going out, that's your savings, and your national savings account if you want to think of it that way, is your reserves. That's what we mean by reserves and China had basically a four trillion dollar reserve at the end of 2014. Today, that number is about 2.9 trillion. In other words, they have lost 1.1 trillion dollars in their reserve position in a little over two years, not quite two years. The reserves are going out the door. Now, people say, "Well, you've got 2.9 trillion left, isn't that a lot of money?" When you look at the Chinese banking system, private estimates are that the bad debts are 25% of total assets. Banks usually run with 5, maybe 7-8% capital. Even if you said 10% capital, well, if 25% of your assets are bad, that completely wipes out your capital, so the Chinese banking system is technically insolvent, even though they don't admit that. I mean, they cook the books, they take these bad loans. Let's say I'm a bank and I have a loan to a state owned enterprise, a steel mill or something and the guy can't pay me, can't even come close to paying me and the loan's due, I say, "Well, look, you owe me 300 million dollars. I'll tell you what. I'll give you a new loan for 400 million dollars, but I'll take the money and pay myself back the old loan plus the interest, and then I'll give the new loan to your maturity and I'll see you in two years." Mike Gleason: Wow, that sounds like a very bleak picture indeed. So, what can China do about this Jim? Jim Rickards: If your investors, your citizens perceive that the exchange rate is going to break and you're trying to maintain the exchange rate, the way you do it, you use your reserves to buy your own currency. So, if money's going out the door and my currency's trying to get weaker, and I'm trying to hold it up to a certain level, I'm trying to peg it to a certain level, how do I actually do that? Now, having said that, China is not actually going to go broke. They understand what I just described to the listeners, they see this coming, so they're saying to themselves, "What can I do? What can China do to keep it from happening?" Well, they can close the capital account and they're starting to do that in a small way. The problem is it's kind of all or none. You can completely close the capital account and use firing squads for anyone who tries to get the money out of the country, but now you've taken yourself out of the international monetary system. They can't do that. They just got into the international monetary system, the Chinese yuan was just included in the IMF’s special drawing rights, that's this world money that the IMF prints. Mike Gleason: Yeah, it certainly is, and China's absolutely stuck between a rock and a hard place as you just described there. Now, let's specifically talk about gold for a minute. Now, we can see two roads higher from metals prices from here, the first would be a return of significant price inflation and weakness in the U.S. dollar. The second route to higher prices would be the return of safe haven buying, driven by serious geopolitical turmoil, China obviously would be at the forefront of that, and perhaps a shock to the global financial system. What do you see as the way forward for metals currently and what do you think could possibly derail this move higher in metals that we've been seeing here in recent weeks? Jim Rickards: Well, I think both of those things are in play. They're kind of opposites but that's okay. Keep the opposites in mind, but whether it's monetary ease and inflationary take off, that'll clearly send gold higher. But even if the opposite happens, the economy slows down, the stock market crashes because of something like the Chinese devaluation that we just talked about, gold will catch the safe haven bid and that will send it higher. But there's a third factor I would put into the mix which is just good old fashioned supply and demand. You know, I travel around the world quite a bit and when I go to Switzerland, I don't spend a lot of time with the banks, I spend most of my time with refiners and vault operators and secure logistics providers, the people that actually handle the physical gold. I recently returned from China, I was in Shanghai and Nanjing, and I met privately one on one with two of the five biggest gold dealers in China, the heads of precious metal trading for two of the big banks, and they said to me, "Don't believe what you read. Demand for gold in China is as strong as ever. People can't get enough." Going back to what I said earlier about people getting the money out of China, well that's fine, if you can, if you're connected enough, or if you're an oligarch, or a princeling, or a business person or whatever and you can find a way to do it. What if you can't? What if you're maybe an upper middle class Chinese (person), you've got some money, a couple hundred thousand dollars, maybe a million, but you're not an oligarch, you're not the son of a survivor of the Long March with Mao Tse-tung. What do you do? You're not buying a million dollar condo in Vancouver, you're just trying to preserve your $100,000 that you've saved up for working hard all these years. Well, those people are buying gold. They don't trust the stock market, they've seen the volatility, they don't the trust real estate market, they know it's a bubble. Some of them might have a condo in China, but there's a limit on that, but they are buying gold. We see it in the figures from the Shanghai Gold Exchange. By the way, that was one very interesting thing I learned when I was in China, because we had some estimates, I formed some and others did as well, about how much gold is going into China or is available for investment by the Chinese. Using mining output, there's pretty good numbers from geological surveys. Hong Kong exports to China, those numbers are reliable, Swiss exports, those numbers are reliable. So, we don't have a complete picture but we had a pretty good idea, and then we also had the Shanghai Gold Exchange physical sales, because that's somewhat transparent. So, putting all that together we were saying somewhere between 1,000 and 1,500 tons a year going into China, but what I did not know until recently was how much of that was private demand and how much of that was government demand, meaning how much was going directly to the government reserve position, how much is being bought up by consumers in China. What they told me, and these are the dealers, these are the people that actually deal on the Shanghai Gold Exchange and handle the metals, they said it's 100% private. They said the government buys a lot of gold but they operate completely off the books, completely through stealth channels. I found out, amazing what they told me was that there was even more gold in China than I thought. I know the Chinese government's buying gold, I know the people are buying gold, but if 100% of Shanghai is just going to consumers, that's a huge number and the government's getting whatever they're getting through other channels. Now, that makes it harder to estimate, but I know enough from being in Russia and Iran and Turkey, and other sources that China is in fact getting quite a bit of output. They're probably getting it directly from the mines. In other words, the Chinese import figures go through the Shanghai Gold Exchange and feed a consumer demand, and the Chinese government controls the mining industry and probably takes all of that, that's 450 tons a year and then some. So, there's a lot more gold in China. Now, what it means, however, is I'm not a geologist, I'm not an expert on what they call "peak" gold, but I talk to enough mining interests and I know that mining output is flat lining at best, perhaps declining, and grade wars are getting worse. There's less gold for every ton of ore that you mine, new discoveries are not piling up, they're not opening mines because of costs, et cetera, and the fact that the price of gold has been down somewhat. So, putting all that together, you see veracious demand, flat or declining supply, physical gold shortages popping up here and there. All it's going to take is one publicized failure to deliver by a major bank or an exchange somewhere along the lines to start a buying panic. Mike Gleason: Talk about what you’re expecting in terms of Fed policy here in the early part of Trump’s presidency Jim. Markets seem to be taking a bit of a wait and see posture here when it comes to monetary policy, how do you see gold responding based on that? Jim Rickards: Gold's got a little bit of a headwind right here in the short run, because I expect the Fed to raise interest rates in March. Mike Gleason: We should probably also touch on developments in Europe, the Brexit vote last year may have signaled the beginning of the end of the European Union. There are some key elections coming up and nationalists and populists are polling well across Europe. If the anti-globalist candidates win elections in places like France or Germany, the EU will be in serious trouble. Would you care to speculate on the outcome of some of these important elections, and then what's behind this movement, Jim? Jim Rickards: Well, I don't really speculate. I use a lot of science. I was one of the ones that beginning last March, that is March 2016, and continuing right up until a couple days before Brexit, to say that the UK would vote to leave the European Union and that you should short sterling and buy gold, and that's exactly how it played out, so we got that one right now. Now what's interesting is that I was on record, I have all the tapes and TV interviews and so forth, saying that the UK would vote to leave the EU, that they would vote for Brexit, and also that Donald Trump would win the election, which I got laughed at when I said it, but that turned out right. So 99% of the pundits and market indicators and so forth, were on the wrong side of both of those. They said that the UK would remain, and that Hillary Clinton would win the election. Now, having said that, a lot of people are feeling burned. They're like, "Oh, man, I got two big calls wrong, I don't want to do that again," so they're now calling for these nationalist parties to win these elections in Europe and lead to the break-up of the European Union, the European Monetary Zone, the decline of the euro, et cetera. I'm now on the other side. Having correctly predicted Brexit and Trump, I'm going to say that these mainstream parties, Angela Merkel, the center parties in France and the Netherlands are going to remain in power, that the EU will stick together, that the euro will get stronger, so I'm extremely bullish on the European outlook. Now, there's going to be some volatility. Some of these minority parties are going to do better. Marine Le Pen will get more votes than she did the last time, the Freedom Party in the Netherlands, Geert Wilders will get more votes than he did the last time. He might even get more than everybody else, but not enough to form a government because no one else will play in his sandbox. So, I think you will see nationalists rising but not enough to takeover and at the end of the day, the center governments will remain in power and the European Union will remain intact, and go back to what I said before about Trump wanting a weaker dollar. Well, currencies are easy. They're cross rates. So, if one goes down, the other goes up, so if you're going to have a weaker dollar, that means you're going to have a stronger Euro, so I'm very bullish on Europe and the Euro. Mike Gleason: Yeah, interesting outlook there and we'll see how it plays out. Your very studied view is worth a lot, so we certainly appreciate your time, Jim. It's always a pleasure to speak with you. We want to urge people to check out the new book, The Road To Ruin, and go to the James Rickards Project website and take a look at how you can follow Jim on a more regular basis. We greatly appreciate you guiding and educating folks on the actions they can take with their investment lives, and hope you have a great weekend and we look forward to having you back on before long. Thank you, Jim. Jim Rickards: Great, thank you. Mike Gleason: Well, that'll do it for this week. Thanks again to Jim Rickards, author of Currency Wars, The Death of Money, The New Case For Gold, and now The Road To Ruin, and also editor of the Jim Rickards’ Strategic Intelligence newsletter. Check back next Friday for the next Weekly Market Wrap Podcast. Until then, this has been Mike Gleason with Money Metals Exchange. Thanks for listening and have a great President's Day weekend, everybody.